In 2008, Tina Pashley put her passion for animal advocacy to work by writing a weekly pet adoption and care column in the Martinsville Chronicle. She currently contributes to two consumer advocacy websites and several healthcare publications. Pashley holds a Bachelor of Science in communications from the University of Phoenix. When many women want to get in good physical shape, they want their bodies to have a toned, sleek look instead of a muscular look. To develop long, lean muscle, strength train consistently with a low amount of weight. Use free weights and strength-training machines to strengthen muscle groups in your chest, arms, shoulders, back, abdomen and legs. 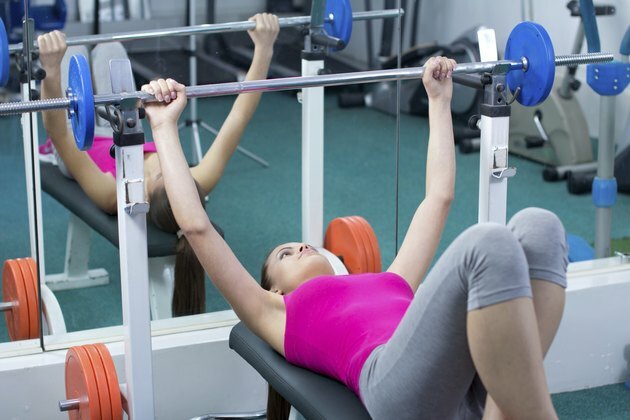 Perform more sets with more repetitions to develop a toned physique. Dumbbells are ideal for training your upper body. Not only do they target the primary muscle being trained, they help build muscle in the stabilizing muscles during exercise implementation. Start your upper body strength-training workout with dumbbell bench presses and inclined and declined dumbbell chest presses to work your central, upper and lower pectoral muscles. Move on to dumbbell biceps curls, military presses and triceps extensions to strengthen your shoulders and arms. Finish your upper body workout with bent-over dumbbell rows and shrugs to target your central and upper back muscles. Perform three sets of 12 to 15 repetitions of each exercise to tone your upper body. Dumbbells and a barbell are helpful when strengthening your glutes, hips, hamstrings, quadriceps and calves. Place a barbell across your shoulders, or hold a dumbbell in each hand at hip height or shoulder height, and perform basic squats and lunges. Both of these exercises help strengthen your quadriceps, hamstrings, hips and glutes. Train your calves with calf raises. With a barbell on your shoulders or with dumbbells at hip height, stand on the edge of a step or other raised surface and complete sets with your toes pointed forward, inward and outward to strengthen your central, outer and inner calves. For toning, perform three sets of 12 to 15 repetitions of each lower-body strengthening exercise. Your abdominal muscles can be trained with body-resistance exercise, meaning that the only weight you need for toning is your own body weight. Perform traditional crunches to strengthen your central abdomen, or modify this exercise by twisting from left to right at the height of the exercise as your chest approaches your knees. Twisting crunches target your obliques to tone the sides of your abdomen. If you have access to a Roman chair, stand with your forearms and elbows resting on the arm rests to support your body and lift your knees to your chin. This exercise will help tone your lower abdominal muscles, an often forgotten section of the abdomen. Perform three sets of 15 repetitions of each abdominal exercise. While strength training is critical for developing and toning lean body mass, aerobic exercise is essential for cutting fat off your body to reveal your newly-sculpted muscles. Perform at least 30 minutes of aerobic exercise every day to blast fat from your body. The more intense the aerobic activity, the more calories and fat you will burn from your body. For maximum fat loss, try running at a moderate to high speed or using a rowing machine or elliptical machine for 30 minutes. How Do I Get a Six Pack if I Am a 15-Year-Old Male?